Alcohol is a potent, addictive form of drug that is very popular among adults. Alcohol brings pleasant sensation even when taken in low doses, but it can be damaging and even fatal when taken in large amount. Drinking alcohol should be done moderately. Unfortunately, some adults tend to lose control when it comes to alcohol consumption. There are people who drink a lot and hurt themselves as a result. Alcohol could be very harmful for teens. Moreover, alcohol drinking is illegal for minors. Ethyl alcohol or ethanol is the generic scientific name of alcoholic beverages. Ethyl alcohol is found in wine, beer and all liquors. But other types of alcohol cannot be consumed for they are poisonous. For instance, rubbing alcohol (isopropyl alcohol) is generally unsafe when drunk. What are the side effects of alcoholic beverages? Alcoholic beverage enters the bloodstream once it reaches the small intestine. It then travels up to the brain, slowing down the reaction time and causing a decline in coordination. Other effects are impairment of vision and inability to think clearly and make good judgments. Alcohol is a very addictive substance. There are 18 million people who are suffering from alcoholism. Those who are addicted to alcohol cannot perform their daily functions without drinking, so they encounter more and more problems each day. Alcoholism can happen at any stage of life, however drinking as early as adolescence years increases the risk of alcohol addiction. Nearly 50% of American teens who began drinking alcohol before they turned 14 are more likely to get addicted to alcohol at any stage of their life. But only 9% of American adults who began drinking alcohol at the age of 21 or above would get addicted eventually. Are certain types of alcoholic drink safer than others? No, since all alcoholic drinks have ethanol. As long as ethanol is there, all alcoholic drinks are equally harmful. The side effects increase as you drink more alcohol. Wine, beer, and all liquors have varying amount of alcohol. For instance, beer contains 3% and 5% alcohol, while wine is 12% alcohol. The alcohol content of liquor is approximately 40%. A bottle of beer has the same alcohol content as a glass of wine or a single shot of liquor. Click here for more information on Hangover Myths. What the reasons behind drinking? Drinking alcoholic beverages is a common part of social life. A lot of people drink alcohol when they hang out with their friends. Alcohol makes people become less inhibited, thereby getting them more sociable. Some drink simply because others do. This type of people always conform to what the majority is doing. However, drinking without restriction can cause serious problems and ruin a healthy lifestyle. There are a lot of people who enjoy savoring alcohol. When taken in small quantity, alcohol could have a positive effect on the heart. When does binge drinking take place? Becoming drunk is very common at parties. Binge drinking occurs when four or five alcoholic drinks are taken in two hours, depending on gender. This is considered as the most dangerous type of drinking. How common is alcohol drinking among teens? A growing number of teens are abstaining from alcohol. As a matter of fact, less than one in 10 teenagers below the age of 14 has taken alcohol in the past month. About 3 out of 10 teenagers aged between 15 and 17 have taken alcohol in the past month. Do not pay attention to anyone who tempts you into drinking by saying that everyone is doing it and so should you. Although common among teens, drinking alcohol is harmful and improper. Why teens should avoid alcohol? There are many good reasons to avoid alcohol or defer from drinking until the age of 21. It is illegal to drink alcohol if you are still a minor. Underage drinking is a ground for arrest and reprimand from the authority. Driving under the influence of alcohol kills 4,000 teens annually. Avoid driving under the influence of alcohol. Also, refuse to ride with colleagues who are drunk drivers no matter how much they assure you of their ability to drive even when drunk. If you do not want to offend them, make some excuses. Tell them you are staying longer in a party or you have promised to ride with someone else. It is safer for anyone not to drive when drunk. Alcohol can damage the brain. The brain of teens keeps on developing until their early 20s. Drinking alcohol incessantly can hamper the brain’s development. It is shown that teens who take alcohol frequently have less reliable memory than their non-drinking counterparts. Alcohol drinking is associated with higher risk of dropping out of school. Drinking alcohol during teenage years increases the risk of alcohol addiction at some stage of life. Drunk people are more likely to get raped, robbed or assaulted. People who are drunk have impaired judgment. If you are under the influence of alcohol, you are more at risk to become injured. 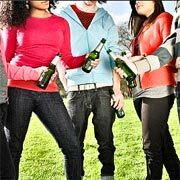 What is the role of peer pressure in teen’s drinking behavior? Teens are often enticed by their peers to drink alcoholic beverages. Teens may feel pressured to conform to their peers’ lifestyle to fit in. But this is not a good reason nor a just excuse to drink alcohol. Remember that alcohol drinking is not a staple for most teens, so refusing a shot of liquor amid peer pressure should be just fine.